You can order replacement box handles for your boxes. Please see the table below (or the alternative one further down the page) to see which handles fit your specific boxes. Box handles are only available in solid blue. Handles will also fit XL and XXL versions of a box e.g. Size J handles will fit 35 litre boxes as well as 35 XL and 35 XXL litre boxes. 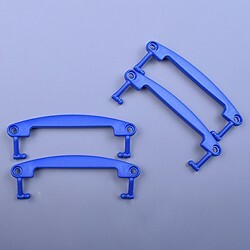 Handles are available in packs of 4 or 12. Check the handle size you need by finding your box size in the table below. Remember that handles will also fit XL and XXL versions of a box e.g. Size J handles will fit 35 litre boxes as well as 35 XL and 35 XXL litre boxes.